After 79 years of operation, Suffolk Downs, the last thoroughbred racetrack in Massachusetts, will close. The track had tied its future to a successful bid by Mohegan Sun to bring gambling (and a resort) to the Revere property; that was derailed when the state gaming commission decided today to give the gaming license to Wynn Resorts. Between 2007 and 2013 Suffolk Downs spent $3.275 million on lobbyists to support casino legislation — a bet that the track and its employees have now lost. Suffolk Downs no longer draws the same kinds of crowds. When it opened. The first year it was open, the track drew 15,000 people per day. Daily attendance was about 10,000 per day until the mid-70s, but dwindled after that. Suffolk Downs was built in just 62 days — transforming 200 acres of mud flats in East Boston and Revere into one of the finest race tracks in the country. 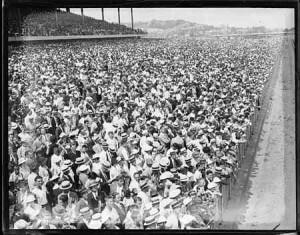 When it opened, the grandstand seated 16,000 making it the largest in the country; the clubhouse accommodated 5,000 and was reported to be the largest in the world. The biggest race at Suffolk Downs has always been the MassCap (Massachusetts Handicap) drawing big time race horses such as Seabiscuit, Whirlaway and Cigar, but the average race was for much lower stakes and the horses running had usually stepped down from the larger, more prestigious tracks. Of course my own horse, Freedom on the Wind, ended his career at Suffolk Downs, so there were still some good ones left! The track was closed for racing after the 1989 season but reopened again in 1991. This time, it seems like there will be no reprieve. It is the end of an era. With Atlantic City in dire straights, do we really need another casino? Maybe Suffolk Downs was no longer in its prime, but to have it replaced by a building full of one-armed bandits adds insult to injury. Watch Seabiscuit win the 1937 MassCap. How cool to see Seabiscuit run! I have such mixed feelings on racing, but I’m sad that many people stand to lose their jobs as a result of the track closing. I, too, have mixed feelings about Suffolk Downs. It hasn’t been a track that attracts top talent for a long time and many of the horses running there are stepping down the ladder as they become too old or too injured to run as fast. Sigh. There are some wonderful trainers there, but there are some who really aren’t. Seeing the backside of Suffolk Downs is sobering. The big push now will be to find homes for trainers who will need to cut their string significantly. CANTER New England will be working very hard for those horses and is a great resource for anyone who is thinking of an OTTB. one of the reasons Atlantic City is in dire straits is the huge success of the casino at Aqueduct Racetrack in Queens. It puts gambling a subway ride away from the population of New York City. The subway terminus in Flushing Queens has its turnstyles decorated to look like the 7s on a slot machine with advertising posters all around. Enjoyed the Seabiscuit clip. I wasn’t aware of that. Guess I don’t keep up with the Casinos. My guess is that a casino in Revere would work the same way, then. For a more sobering look at the backside of racing: There has been a very high rate of horse breakdowns at tracks that have become racinos. As interest in horse racing has lessened, racetracks like Aqueduct in New York are trying to interest new fans and are offering higher purses out of the cash flow from the slots. This has led to unfit horses being run, their lack of soundness being masked by pain medications. Between issues with footing (Del Mar) and what you linked to, racing isn’t looking too good right now. Very sad to see where the sport is going.